A Walking Tour of Lerwick. 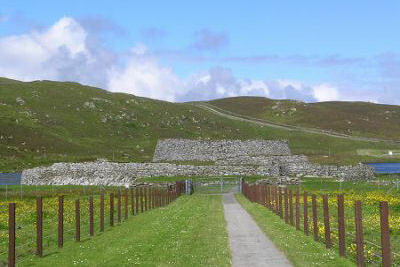 If you want to take a look around Lerwick, this quick guide should help get you going. It is a fairly leisurely walk of just over 4 miles (about 6.5 kilometers) and there are quite a few things to see along the way. Commercial Street from the Market Cross. Looking past Anderson and Company towards the Royal Mail Post Office and Sorting Centre. The Royal Mail Post Office and Sorting Centre. From outside the Tourist Office, turn towards Anderson and Company and follow Commercial Street past the Post Office to the pedestrian crossing at Church Road. Take care on the crossing as it is "blind" to traffic from both sides. Once across the road, on the left hand side you will see the old Tollbooth. Dating from 1776 this was originally Lerwick's Sheriff Court and Prison (nicknamed "Nicoll's Hotel", after the sergeant whose job it was to guard the prisoners). The Tollbooth is now home to the Royal National Lifeboat Institute (RNLI) and contains a small shop which helps support the charity. Continuing along Commercial Street you will pass by the Queens Hotel which is built out into the harbor, mimicking the lodberries which are to be found a little further along. Right next to the Queens Hotel is the sandy Bain's Beach. If you go onto the beach, take care on the steps down as they are a little rough and can be quite slippery. The building at the far end of the beach is called "The Lodberrie" and is the most famous of this type of building. Lodberrie is derived from an old Norse word for a flat rock at which a boat could dock and load/unload it's cargo. The Lodberrie is now a private home, but it has gained some fame as the home of "Detective Jimmy Perez" in the Anne Cleeves novels which have been made into the TV series "Shetland". A boat for a roof ? Why not ! 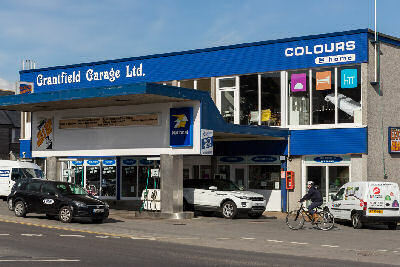 Continue along Commercial Street as it merges with Twageos Road and, on the left hand side you will see a garage that uses an old boat as it's roof. The boat once carried mail to the remote island of Foula, but as the Shetland Islands are nearly treeless making wood a precious commodity, throughout it's history Shetlanders' have re-cycled in this way to make sure that everything is fully utilised. As you continue along Twageos Road you will pass the "Anderson Homes for Widows" on your left, and shortly after, the old "Anderson High School" on your right. These buildings were endowed by Arthur Anderson who was one of the founders of the P&O Shipping Company. Born in Lerwick, he made many philanthropic contributions to Shetland during the Victorian era, many of which are still in use today. After a small ascent, you will reach the top of the Knab. Here you will find a small seating area with information boards detailing the development of Lerwick through it's harbour and it's role in the World Wars. From the seating area, pass through the gate and follow the path as it continues around the headland. This path offers some stunning views across Brei Wick to South Lerwick and southwards along Shetland's south east mainland. Passing through the gate at the end of the path and turning left you will be able to follow the coast as you descend along Breiwick Road. At the foot of the road is a sea wall and, at the far side of this wall is another gate. Continue through this gate along the coastal path known as "Da Sletts". The rugged coast surrounding Brei Wick is made up of sandstone which began life 400 million years ago as part of a desert when Lerwick would have been at the foot of the Caledonian mountain range in the super continent Pangea. The sedimentary nature of these rocks means that they tend to erode into flat surfaces making them a favorite spot for seals to come out of the water and sunbathe. The seals tend to blend in well with the rocks so, keep a lookout for movement as they shift around. There are 2 types of seal which are resident around Shetland. Grey Seals and Common Seals. Please try not to disturb them. Continue to the roundabout next to the Tesco supermarket. If you wish to see more seals, turn to your left at the roundabout and follow Sea Road as it continues around the coast otherwise, use the "islands" to cross the road and continue on past Tesco's (keeping it on your left) until you come to a pedestrian crossing. Use the crossing to switch to the other side of the road. 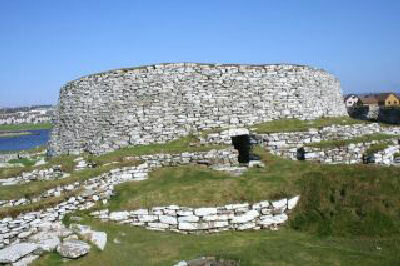 You will shortly arrive at the access path to the Broch of Clickimin. What these fortified structures were used for is a bit of a mystery. Built around 2000 years ago, when there were no written records, the best we can offer is an information board that tells you what little we do know. Walk back to the main road and turn right. The field next to the road often contains horses and ponies and, quite often, there a a number of Shetland Ponies to be seen here. These iconic ponies, although they are small in stature, are extremely strong and sturdy and were used in the past for transporting "bulk". Once the road network was developed and with the advent of vehicles, these ponies became obsolete but, it's small size and strength brought about a new career in the coal industry. 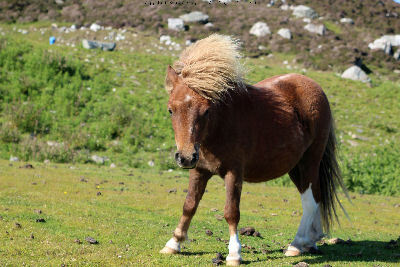 The Shetland Pony became the workhorse of choice in the coal mining industry of Britain and Europe. These days, the ponies are not kept for grueling labour but, for the love of the breed and their excellent nature as companions to other horses. Please take care if petting them and, please show them a little respect. Turn right on to Westerloch Drive and follow the road around the edge of the Loch of Clickimin. At the end of the road, a path continues all the way around the loch as far as the New Anderson High School, Clickimin Leisure Centre and Playing Fields. The loch often contains a selection of wildfowl and swans. Please take care and try not to disturb them if you can. Shetland has gained a number of benefits by being a hub for the North Sea Oil Industry and various trusts were created when oil started coming ashore at Sullom Voe. 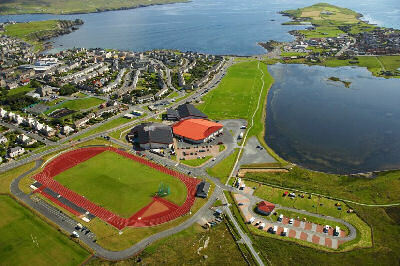 One of these trusts is The Shetland Recreational Trust which runs the Clickimin Leisure Complex and a network of sports and leisure facilities to be found in population centres around the island. 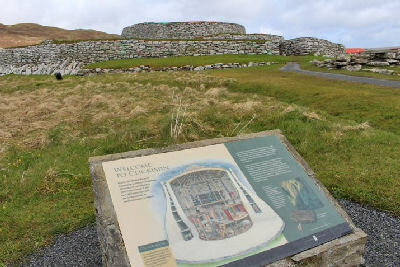 From the Museum, it is a short walk back to the centre of Lerwick.